Amit Bhatia insists QPR needed change at the top in order to stand any chance of surviving in the Premier League. Bhatia is back at Loftus Road as company vice-chairman – the position he quit in May after a disagreement with Flavio Briatore. He will work alongside new majority shareholder Tony Fernandes and believes the pair can help establish Rangers in the top flight. “We badly needed stability at the club,” Bhatia told West London Sport. “You can get away with certain things in the Championship but in the Premier League you’re playing on a different stage and you have to conduct yourself in a certain way. It’s different. He added: “I’m thrilled to be back. I received an incredible amount of support when I resigned. I received literally hundreds of letters from fans. “I was very humbled by it – and felt very sad too, actually, because some people obviously felt I’d done some good and wanted me to stay involved, yet circumstances meant I couldn’t. Last year it was suggested the Mittal family had ousted Briatore from power, which was never the case. But Bhatia says this time there is no room for doubt that the Briatore era is over, and that all ties to the Italian and former co-owner Bernie Ecclestone have been cut. Bhatia said: “Last season I was very much the one guiding the club along with Neil Warnock until Flavio and Bernie did get involved again. “Now, there is absolute 100% certainty that Flavio and Bernie are no longer involved with QPR. Their shares have totally been bought and they have no board representation. 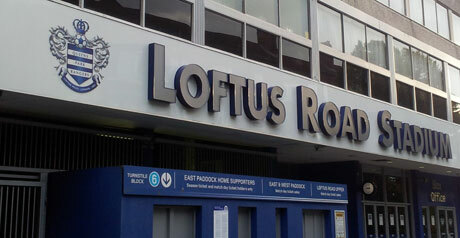 Bhatia says that also applies to ownership of the Loftus Road ground, which effectively passed into Briatore’s hands when he facilitated a loan to pay off the infamous £10m debt to ABC Corporation, which was secured using the stadium as collateral so that Rangers could come out of administration in 2002. “That loan will probably continue to exist, but it has now been bought off [by the new regime],” Bhatia explained. “The stadium loan when we inherited the club was a loan that was unfair on QPR and brought an extremely high rate of interest. “We decided to replace the loan with our own loan, which was done on an interest-free basis. It was to lighten the burden on the club. Bhatia confirmed the new-look board are reviewing the position of Gianni Paladini, who has been stripped of the role of club chairman – a title he held for six years and retained despite a number of changes to the company board. “Flavio and Bernie are out and Gianni’s situation has to be reviewed,” he said. “He brings some value to the club, but there are other things that we have to make sure are treated correctly and done in the proper way. The new loan is zero %. This is a huge milestone in the history of QPR. Thank you Tony and Amit. Here that Flav…….your involvement in QPR is “COMPLETELY FINISHED” – oh yes!!! I’m probably the most excited i’ve ever been in the 27 years i’ve been supporting the club. I’ve seen two promotions and a take over by three very rich chaps but this time im really excited by the enthusiasm, respect for fans and general common sense of our new board. Nothing I can say here that hasn’t been said already. Amit, fantasic to have a man who understands back at the Helm. Finally feeling like we have a bright future again!! Warnock + Amit = success. FACT! It’s been proven. Hopefully with Tony on board we can achieve even better things now. Great news for the club. We have seen many at Loftus Road. Last season Amit proved himself to be honest, moralistic and understanding of the pride Rangers fans hold in our club. After the Briatorie roller coaster and the humiliation it brought to the fans and the club, I am delighted with today’s news. Finally we can have hope for a sustainable stability and we can move to close a chapter on the soap opera that our club has become over the last 5 years. and welcome to Tony. Lets share your passion for football with the passion we have for our club. And a huge WELCOME BACK to Amit, Our club is better for you being in it, and will continue to get better because you are. Lets embrace the new dawn and raise the roof on fortress Loftus. Whatever mauling may pass we can again be proud of our club. We can be proud of our manager and proud of our team. Everyone will play their hearts out for our club this year. So lets make sure we do ourselves proud, and lets sing our hearts out for our team!!! and lets make some beautiful NOISE !!!! Why didn’t the Mittals buy the 66% on offer? What can Mr Ferdandes’ 200m giveus that Mittal’s 20bn couldnt?? I have 75 of the `missing` shares proudly displayed in my hallway.The frame they are in is probably worth more than the shares displayed but i do (in a small way) own a bit of QPR.My workmate reckons the bit i own is the ballcock in one of the toilets in the stadium…lol…. I like the man from Bodmin refused to sell my shares,after supporting for 50 years last saturday was a real lowpoint,today I am optimistic that we now have a fighting chance of staying up. Thankyou Tony fernandes and welcome back Amit. Great informative stuff…. this whole thing can’t be as good as it seems can it? Just waiting for a massive kick in the nuts!!!!!! The remaining 1% is mainly shares still held by fans from when QPR was originally floated in 1996. People like the old chap at the friendly at Bodmin, who told me Briatore would walk over his dead body before getting his shares! Cracking set of quotes, answers pretty much all the questions i had apart from one, who owns the remaining 1%? Brilliant news though, best thing that’s happend to us for years. Old NW looked so bloody happy today, think he’s known for a while otherwise he’d have jeffed off in summer. Love the website to Dave, nice work.